Dedicated on Feb. 15, 2009, the Forest is approximately 53 acres in size, extending from the north boundary of the Nature Center to the southeast side of the Montaño Bridge. Plans for the forest include a naturally surfaced trail extending from the existing paved trail. 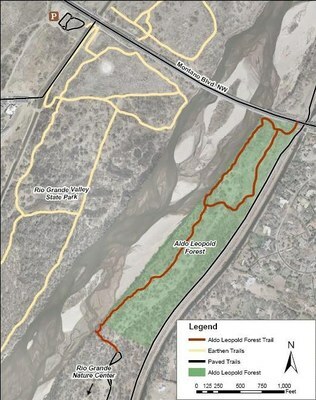 This trail would connect to the Montaño Bridge and will tie into existing trail systems on the west side of the river at the Pueblo Montano picnic area. After the trail is complete, hikers, mountain bikers, and equestrians on both sides of the river will be able to enjoy an improved and expanded trail system. Additional plans include interpretive signage that will honor Leopold's legacy in New Mexico by promoting Leopold's vision of an ethical relationship with the land. The Open Space Division is also planning rehabilitation of the area including the removal of exotic species and the planting of native shrubs and cottonwoods. "I am glad I shall never be young without wild country to be young in. Of what avail are forty freedoms without a blank spot on the map?" 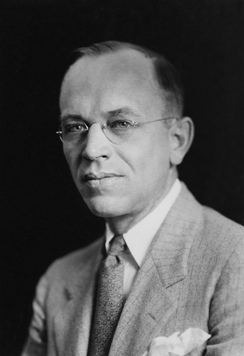 Aldo Leopold, considered the father of modern wildlife ecology, spent many years of his life in New Mexico and left behind an impressive environmental legacy in our great state. Among his many accomplishments are the creation of the Gila Wilderness near Silver City (the first proclaimed Wilderness area in the U.S.) and the foundation of the Albuquerque Wildlife Federation. He also strongly advocated for the responsible growth of Albuquerque during his time here. In 1909, Leopold graduated from the Yale School of Forestry and started a career with the U.S. Forest Service in Arizona and New Mexico. 2009 marks the 100th Anniversary of his arrival to the Southwest and the beginning of his celebrated career. Leopold had a special love for Albuquerque. It was here where he met his wife Estella and lived in a house near the Rio Grande. In 1918, Leopold served as the Secretary of Albuquerque's Chamber of Commerce. At this time he promoted the creation of what would later become the Rio Grande Valley State Park. Leopold's vision and efforts also eventually lead to the creation of the Rio Grande Zoological Park, Botanical Gardens, and the Rio Grande Nature Center.